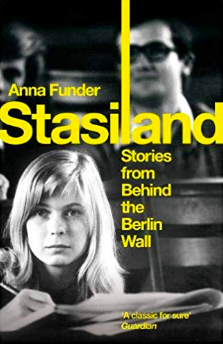 If you’ve taken a Cold War tour with me, you’ll already have heard this recommendation, but it’s worth repeating that Anna Funder’s ‘Stasiland’ is a must-read for anyone who wants to understand the complex and recent history of espionage, mistrust and betrayal in this city. Funder, an Australian journalist based in Berlin and Leipzig in the mid-90s, intrigued by the enormous surveillance operation undertaken by the East German Ministry of State Security, wondered to which degree citizens of the DDR had submitted to the organisation’s authority, and how they may have resisted it. Funder encounters numerous ex-Stasi who are willing to talk, and with unexpected humour and pathos she teases out the stories of those who worked for this insidious organisation.